Achieving shared objectives with the client and designing an effective response to the needs that arise are the starting point and linchpin of the consultation process for Infonet Solutions. 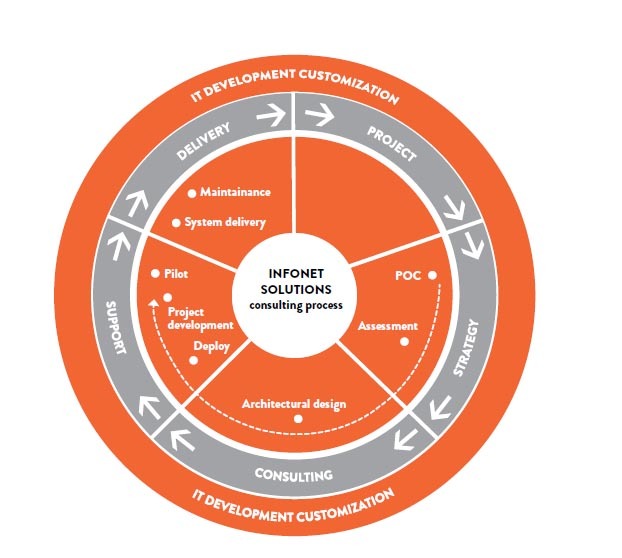 The Infonet Solutions design process, managed by a dedicated technical panel, offers clients a complete service, from infrastructure analysis to maintenance and support. The first step involves project analysis, which includes examination of the status quo and the structure of the client company, with focus on needs, development strategies and margins, and real targets. A requirement definition approach is then used to define the types of applications to implement and the tools to use to ensure maximum business service reliability. Definition of the technical project is the heart of the design phase: for this, the experience of the Infonet Solutions experts is combined with the client’s needs for the proposal of a new, custom-designed infrastructure resulting from extensive technical analysis. The most suitable Recovery Time Object (RTO) and Recovery Point Objective (RPO) solutions are chosen and perfected, with the aim of preserving business continuity, and disaster recovery tools are developed, with the possibility of remote backup solutions. Based on the type of infrastructure and system requirements, Infonet Solutions then guides the client in the choice of the right Cloud Computing system, whether private, public or hybrid. Great attention is also given to the delivery phase: once the new infrastructure design is developed, this new step is supported by a proven project management methodology, which ensures achievement of the set goals in line with the budget and planned deadlines. Planning and coordination of the activities and constant monitoring of their progress allows us to control critical issues, reduce and manage risks, detect any deviations, implement corrective measures and provide the client with project status reports.